The ICD would like to extend its sincere gratitude to all those in the organisation of the conference and to the entire UN and Cultural Diplomacy team including; Nora Sarga, Bastian Renner, Richard Brown, Manus O Donnell, Timea Klebercz and Laurens Bluekens . Special thanks go to team leader Giuseppe Colucci for all of his hard work, inspiration and dedication to the success of the conference. Finally, the ICD and all of the organizers would like to thank the participants and speakers at the conference, whose enthusiasm and participation were a vital contribution to the phenomenal success of this exciting and vibrant international event that was thoroughly enjoyed by all involved. The 'Berlin Freedom of Expression Forum' is held annually at the Institute for Cultural Diplomacy's international headquarters in Berlin. With the rising importance of online media, and the increasing role they play in civil society, this year's theme was 'Censorship and Freedom in Traditional and New Media: The Revolution of Media as a tool of Freedom of Expression'. The aim of this year's conference was to reflect on the concepts of freedom and censorship and look at both past and future challenges to realizing complete freedom of expression. The conference was composed of lectures, speeches, question and answer sessions and panel discussions with many high level journalists and freedom of expression advocates participating. One of the highlights of the conference was the "Speakers Corner", which was inspired by a place of the same name in London. 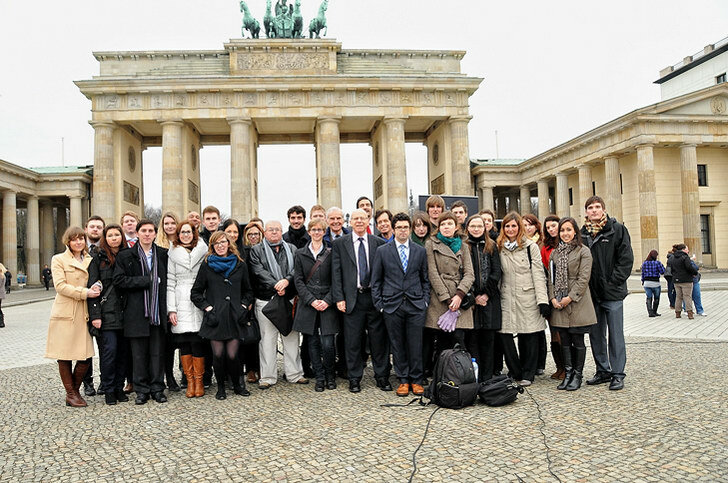 Speakers and participants moved from the ICD House to a stage in Pariser Platz, in front of the backdrop of the Brandenburg Gate, a symbol which stood in the center of a divided Berlin for nearly half a century. The location highlighted the importance of the role that freedom of expression and freedom of the press can play in preserving our human rights. "Realism or Hypocrisy" - Western Diplomacy and Freedom of Expression"
"´Strasbourg` Privacy and the Purpose of Free Speech: Reflections on Von Hannover v Germany (No 2)"
"The Forfeiture of Freedom of Expression"
"Media Freedom and Challenges in Europe"
"Don"t be a Maybe - Challenges and Attitudes in Modern German Journalism"
"It"s None of Your Business: The Challenges of Getting Public Information to the Public"
10:00 "Rights & Freedom in the Age of New Media-Conflicts of Freedom of Expression In The Modern World"
ICD House of Arts & Culture "The Global Struggle for Freedom and Control of the Internet"
ICD House of Arts & Culture "News Literacy in the Digital Age: Educating and Involving the News Consumer"
ICD House of Arts & Culture "Media Freedom and Challenges in Europe"
10:45 "The Situation of Freedom of Expression & Human Rights in Syria"
ICD House of Arts & Culture "Free Expression, the Use of Media in Waging Mass Public Protest, and the Political Realities Facing those who Wield Power and those who Seek to Remove Them"
ICD House of Arts & Culture "Realism or Hypocrisy" - Western Diplomacy and Freedom of Expression"
ICD House of Arts & Culture "Secret Courts and the Rule of Law, the Right to Petition and Narrow Rights of Freedom of Expression"
12:00 "Freedom of Expression in the Triangle of Russia, China and Syria: Can Cold War Cultural Diplomacy Strategies be re-applied to assist Here""
Marta Cooper "Speaker Corner" "The New Role of Social Networking: Facebook and Protests (Case Study: Romanian Protests)"
(Editor in Chief, Delfi.Lv, Russian Edition) "Los Gitanos: the Spanish Gypsies - Media Access and Expression as a Tool for Integration"
14:30 "Why is Press Freedom an important Issue in Central Europe""
"Freedom of Expression: The Essential Civil Liberty. Its Demands and Constraints"
ICD House of Arts & Culture "The Forfeiture of Freedom of Expression"
15:00 "Journalism in the Age of New Media: Implications for Freedom of Expression"
ICD House of Arts & Culture Continue"
ICD House of Arts & Culture "Why Students and independent Journalists must have the same Protections as their professional Peers"
15:30 "Cultures of Collaboration: Making the 21st Century Safe for Journalism"
ICD House of Arts & Culture "Human Right of Press Freedom and Freedom of Information for New and Traditional Media"
ICD House of Arts & Culture (15:15) "Don"t be a Maybe - Challenges and Attitudes in Modern German Journalism"
"The Role of Social Media in Political Mobilization: a Case Study of the January 2011 Egyptian Uprising"
"A Call for Focus in Cultural Diplomacy"
"The Reception of the Jolie film In the Land of Blood and Honey in Serbian Press and Internet Portals, a Case Study"
16:30 "American Media Stereotypes: The Decline of Old Ones, Concerns of the New"
ICD House of Arts & Culture "The De- Professionalization of the Fourth Estate: Social Media and their Consequences"
ICD House of Arts & Culture "It"s None of Your Business: The Challenges of Getting Public Information to the Public"
17:30 "The Application of Cultural Diplomacy Practices in the Media to promote greater Freedom of Expression"
ICD House of Arts & Culture "The Rise of Economic Protest Movements: the Revolution of the Media and Cultural Diplomacy as Tools to Mitigate Economic Inequality"
Josh Wolf "Different Cultures, Different Forms of Freedom of Speech: How can Cultural Diplomacy assist in bridging the Gap"